1. To make the roasted garlic purée: Preheat oven to 400. Cut 2 large plump garlic heads in half through the equator. Drizzle with olive oil, put the halves back together, wrap in foil and cook 40-60 minutes. Check after 40 to see if the cloves are starting to brown, if so they are ready! Let this cool completely then squeeze the cloves out into a bowl and mash them. Set aside. 2. 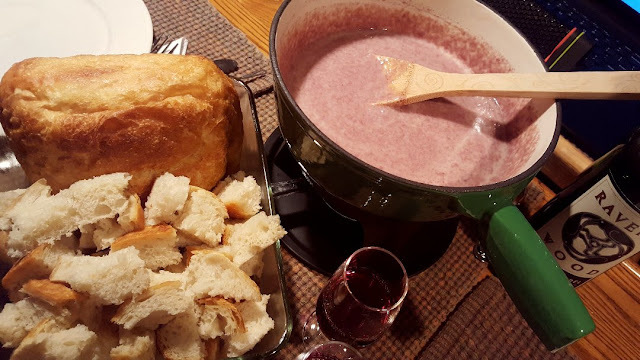 Heat the wine and vinegar in a fondue pot over medium heat. 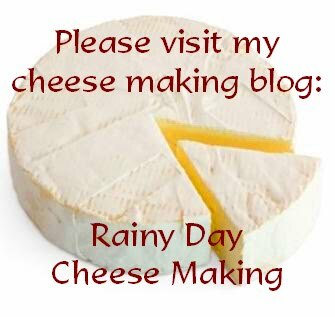 Mix the cheeses and flour together in a big bowl and then add the cheese mix, one handful at a time to the hot wine until it melts. 3. When all the cheese is melted, take the pot off the burner, add the garlic purée and whisk well. Serve with homemade bread. ***this is very garlicky - too much for us, next time I will cut this in half.